Many years ago I lived on the fringes of the great Mbaracayú forest in eastern Paraguay. One day, while walking along a stream bank in the forest, I saw one of the weirdest ants I’ve ever laid eyes on. It was big, black, and looked like it could be folded up flat and tucked into a book. 1. What is this two-dimensional ant? (to species, 5 points). 2. Where does it make its nests? (5 points). 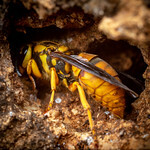 Points will be awarded to the first correct guess for each question, and the cumulative points winner across all mysteries for the month of March will win their choice of 1) any 8×10-sized print from my insect photography galleries, or 2) a guest post here on Myrmecos. Typo: C. mirabilis. The queens are mind-blowing. Camponotus depressus. In bamboo stems. Don’t you mean Camponotus compressus? Ah, late again. Camponotus depressus it is. Nesting in dead Guadua bamboo stems. I saw these in riparian woodland (cerradão) in the the savannas of Mato Grosso, BR. Never found a nest though. Seems well formed to nest under bark of dead limbs and snags. 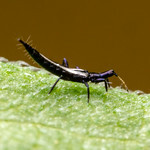 I would propose the ‘turtle ant’, Cephalotes varians. It lives in wood cavities in branches. Ack, most definitely not. Still, those are pretty flat. Perhaps there was an udetected bamboo thicket nearby the one I saw.